Our 510gsm event banner is probably the lowest cost full colour printed banner of this quality in the UK. A fantastic entry level product and ideal for cheap pvc advertising banners. Our event banner material is generally what your average sign or print shop will produce. 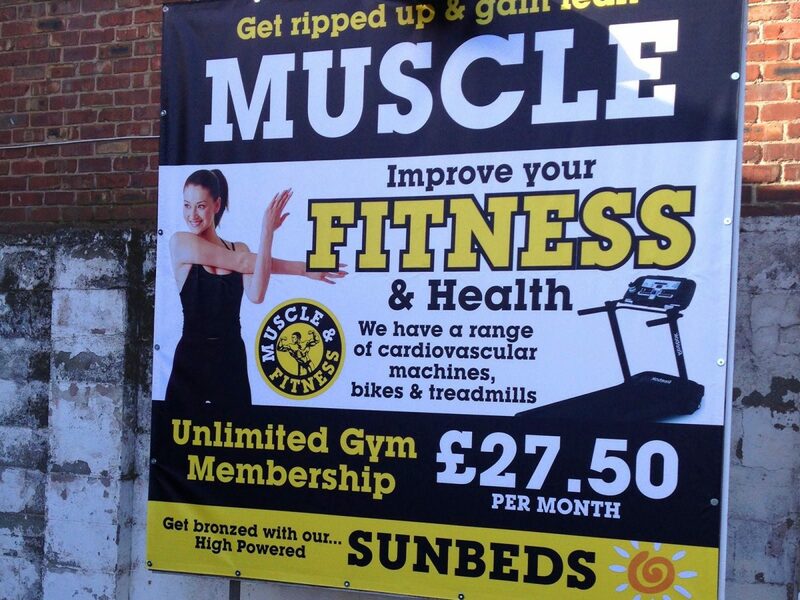 A laminated banner material, 510 gsm weight as opposed to the more generally used 450gsm sign shop grade. Printed in exactly the same way as our Premium Trade 500gsm banner, the only difference is the banner material itself and the rock bottom prices! Suitable for banners up to 2.5m high x any length – or 2.5m long x any height. Lovely banners, saved us so much from last year’s. Really impressed. We originally sent artwork including some sponsor logos that were not quite good enough. Banner World advised before printing and helped us get it right for our 40 banners. Thanks so much for these banners for our charity event, we will be using you again! Best price we found, the banners arrived on time and look great. Recommended. A high quality event banner printed onto a high quality 510gsm frontlight material. Ideal for events, festivals and exhibitions our 510gsm event banners are printed using durable UV print technology. For our premium trade 500gsm banners please click here. 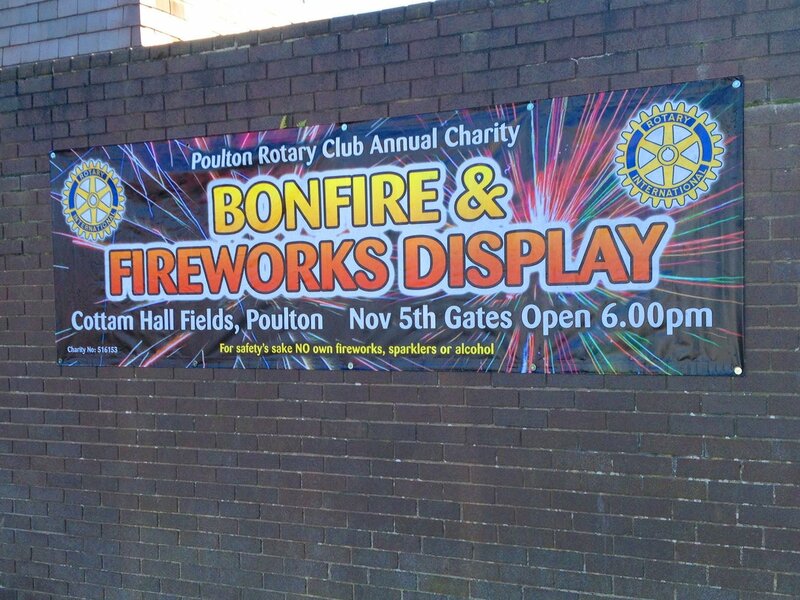 For example, 4 event banners at 3m x 1m will cost only £94.00 plus vat! You can even send different artwork for each banner! 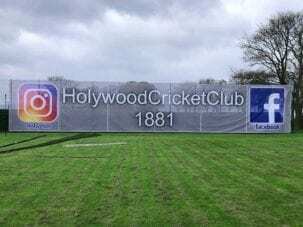 Use Event Banners for sports events, school banners, promotional banners, personalised birthday banners, festival banners, promotional banners and more. 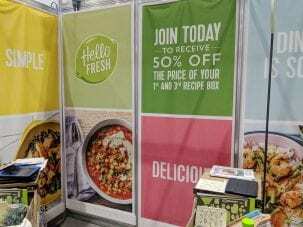 These are a great solution for an outdoor trade show stand, banner display stands or as short-term fence graphics. Finishing is free so you can calculate cost below with peace of mind knowing that the price you see is the price you pay. Standard finishing including hems, eyelets and/or Pole Pockets is included free of charge. 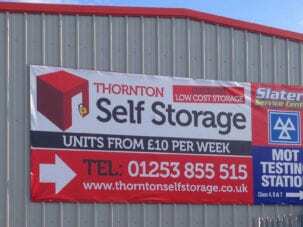 PVC printed Event trade banner is weather and flame resistant, and can be finished to your specific requirements be it hem and eyelets, pole pockets or customised finishing. Ideal for short-to-medium term outside use our event and festival banners are printed at up to 2.5m in ONE dimension. For example, your banner could be 2.5m wide x any height, or 2.5m high x any width. 510gsm banner is printed using high quality UV print technology. This print process allows us to quickly make high quality banners which will stand up to the elements. We print Event Banners on roll widths up to 2500mm. 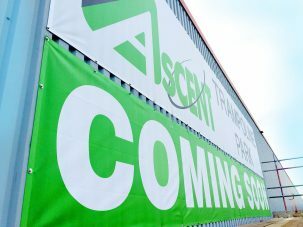 Larger banners are printed on premium 500gsm banner material at widths up to 5m (more when panels are bonded together). The main difference here is the quality of the banner material. 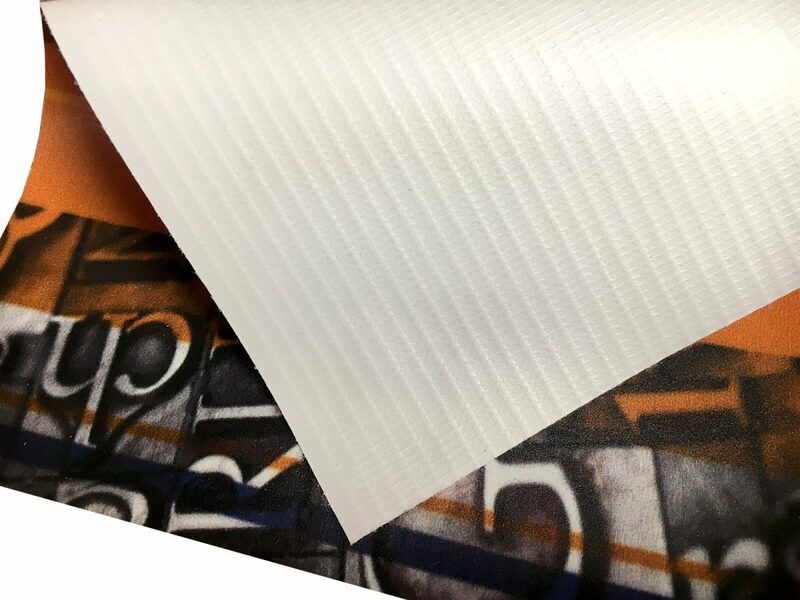 It is stronger and will last longer, printed on roll widths up to 5 metres. Please set your artwork to the correct dimensions of your final printed event banner. We do not require any bleed on the artwork for an event banner. If necessary, you can set your artwork to scale. Please make sure that you set your colour settings to CMYK. Our UV printers use a full colour printing process which works using CMYK inks. Files that are sent to use using an RGB setup will be changed automatically. Sometimes this can make the colours on your printed banner seem weak & washed out. We will check for this before printing and contact you if required. Please leave clear area approx 50mm inside the outside of the banner. Background colour / images are fine, just no important text elements, small print or logos as these can be obscured by the eyelets. 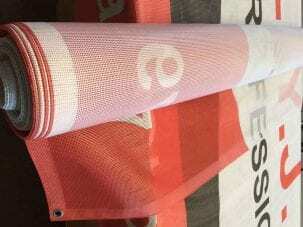 Around our mesh banners we will add hem and eyelets unless otherwise stated. It is not advised to have just eyelets (without the hem) as this can cause the material to rip. Because event banners are used for advertising its always important to think of viewing distances. Always create your artwork to give the highest possible impact. Contrasting colours will give your banner much more clout than washed out subtle colours. Also think about text sizes. The larger the text the more easily it will be viewed from a distance. Use upper and lower fonts. Look at road signs as they are all in upper and lower type rather than all capitals. Subconsciously your eyes will read upper and lower (sentence case). Font type…. Normally clearer fonts work better than stripey unreadable fonts. Look at most main brands, i.e. McDonalds, IKEA, B&Q, Dominos Pizza – all these companies use very readable fonts and typefaces. Less is more, cramming every little bit of information onto your banner probably isn’t a good idea. Remember to use clear areas of space and give your design space to breathe. The best adverts are always simple and straight to the point. Remember your average viewer needs to read your message in 3 seconds or less. Screws can be used, with large penny washers over the eyelets to protect the banner. It is vital to achieve the proper tension on banners fitted by this method – too loose and the wind will cause the banner to flap and affect hems and eyelets. Plastic cable ties are ideal for fixing Event Banners to fencing or railings. 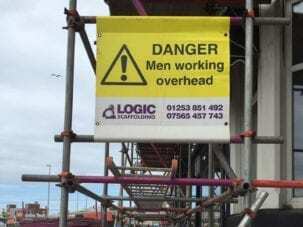 Once fixing points have been identified on the fence, wall or structure – typically large eye or hook bolts – bungee clips or ties can be used to attach to the banner eyelets. This method tensions the banner as well as allowing some ‘give’ when the wind hits, thus protecting hems and eyelets. For secure wall fixing a steel wire frame can be run though eye bolts approximately 300mm outside the banner. Once the wire is tensioned, the banner can be fitted using a zig-zag of bungee cord. This gives the effect of a trampoline on its side, tensions the banner and allows some ‘give’ for high winds. Set with 25mm bleed - Make sure that there is a free area all around of at least 50mm for hem and eyelets. 2500mm in ONE dimension. ie. 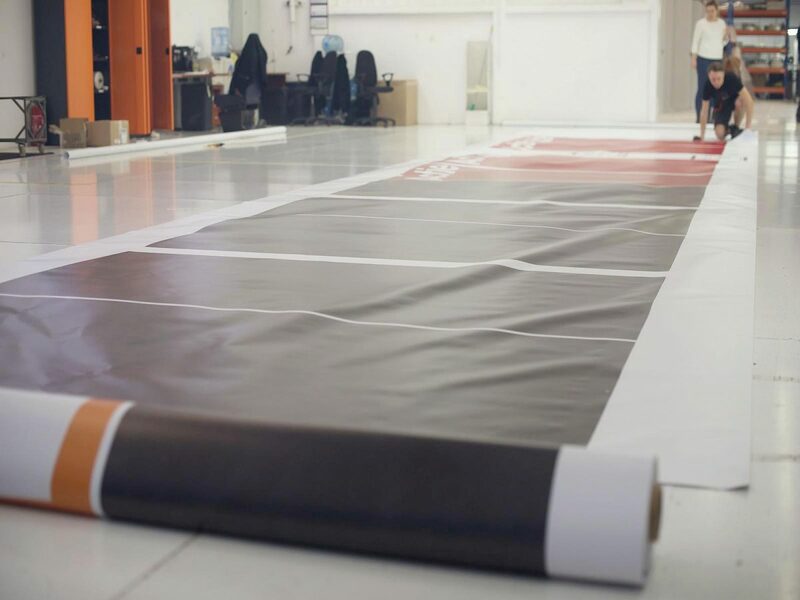 Your banner could be 10 metres x 2.5m. We will only check sizing and quality issues before production. Please be conscious that you are responsible to provide correct artwork. Will you ship my parcel in plain packaging? Yes. Plain packing is standard on all items. No branding will be shown inside or outside of the package. I want to order x6 banners but have a few artworks. What do I do? Upload the artworks and then let us know your breakdowns in the additional information box. We never charge any extra for multiple artworks. What is the difference between event banner and premium banner? Event banner is a laminated material which is cheaper to manufacture. Premium banner is a coated product which is much stronger and more suitable for longer term outside applications. How long can this product last outside? Up to 6 months outdoor life expectancy. Remember banners are only as good as they are fitted. If tightly attached to a wall it could last longer if in a sheltered area. For example if loosely attached to railings wind will move the banner and friction on the railing will cause the material to fray. The tighter the banner is fixed the less likely it is to get damaged. Do you charge for hem and eyelets or pole pockets? No. Standard finishing is included in the cost. Specialist finishing could be charged additionally. Orders that are over £250 will be shipped to a UK mainland address for free (excluding highlands) Orders under will be charged at £12 for UK mainland. What is the specification of your eyelets? Our eyelets are nickel plated. The centre hole has a diameter of 12mm and our eyelets are positioned approx every 500mm apart unless otherwise stated. Can you ship banners around the world? Yes we ship worldwide. Please email us your requirements for a quote. What material is your event banner? Our event banner is manufactured from a 510gsm PVC laminated material. The material is more cost effective than our premium banners and is ideal for short to mid term usage. Still high quality, other suppliers online actually describe it as their ‘premium’ banner. Yes we can manufacture your banner with pole pockets if required. Can I have a banner larger than 2.5m in any one dimension? Yes we can manufacture a banner larger than 2.5m in one dimension only. One length has to be under 2.5m due to the material roll width. For larger banners you will need our PVC Premium Banner. Is the print quality the same as your premium banners? Yes the print quality is the same as our premium banners. Yes, please check our Samples page.